(CNN) -- Advances in the study of coral in the last few years has led a group of scientists to conclude that corals almost rival humans in their genetic complexity and their relationship to algae is key to their survival. Corals' communication system with algae is affected by changes in sea acidification. "We've known for some time the general functioning of corals and the problems they are facing from climate change," said Virginia Weis, a professor of zoology at Oregon State University and an author of a report published in the journal Science. "But until just recently, much less has been known about their fundamental biology, genome structure and internal communication. Only when we really understand how their physiology works will we know if they can adapt to climate changes, or ways that we might help." The study found that corals have sophisticated systems of biological communication that are being stressed by global change. Disruptions to these communication systems, particularly between coral and the algae that live within their bodies are the underlying cause of the coral bleaching and collapse of coral reef ecosystems around the world, say the report's authors. Corals have been a highly successful life form for 250 million years. They are tiny animals and polyps that exist as genetically identical individuals, and can eat, defend themselves and kill plankton for food. In the process they also secrete calcium carbonate that becomes the basis for an external skeleton on which they sit. These calcified deposits can grow to enormous sizes over long periods of time and form coral reefs -- one of the world's most productive ecosystems, which can harbor more than 4,000 species of fish and many other marine life forms. But corals are not self-sufficient, say the authors of the report. Within their bodies they harbor highly productive algae -- a form of marine plant life -- that can "fix" carbon, use the energy of the sun to conduct photosynthesis and produce sugars. What scientists are learning, however, is that this relationship between corals and algae is also based on a delicate communication process from the algae to the coral, telling it that the algae belong there, and that everything is fine. Otherwise the corals would treat the algae as a parasite or invader and attempt to kill it. 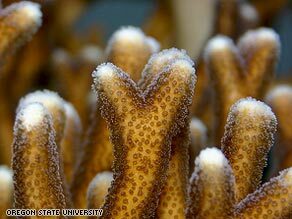 "Even though the coral depends on the algae for much of its food, it may be largely unaware of its presence," said Weis. "We now believe that this is what's happening when the water warms or something else stresses the coral -- the communication from the algae to the coral breaks down, the all-is-well message doesn't get through, the algae essentially comes out of hiding and faces an immune response from the coral." The predicted acidification of the oceans in the next century is expected to decrease coral calcification rates by 50 percent and promote the dissolving of coral skeletons, the researchers noted in their report. Some estimates have suggested 20 percent of the world's coral reefs are already dead and an additional 24 percent are gravely threatened.